The initial report by market analyst BCN Retail, published in the beginning of December 2017, and covering the period between July and October 2017, situated Sharp as the smartphone market leader in Japan with 19.1%, followed closely by Sony with 17.9%. Ranking third was Huawei with 15.8% of sales, while other manufacturers shared the remaining 47.2%. The analysis was only based on the sales of the Aquos R and did not take into account the release of the Aquos R Compact and the Aquos Sense, or the Android One S3. Expectations of continued growth were fulfilled, and the BNC report published on 26 January 2018 once again positions Sharp as the market leader for 2017 – now with 20.6% of the market for Android-based smartphones. Sony remain second with 19.5% and Huawei rank third with 16.4%. As can be seen by comparing the figures, the share of other manufacturers has dropped significantly from 47.2% to 43.6%. iPhone is still the undisputed market leader in mobile devices in general, regardless of platform. 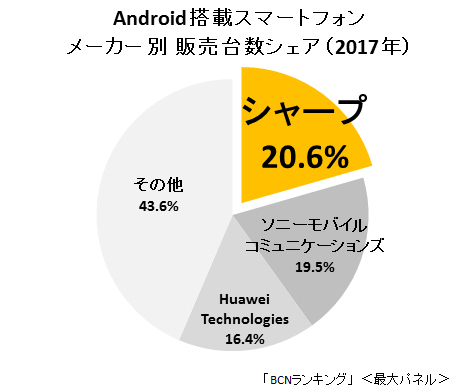 The analysis also accounts for a notable growth of the smartphone market altogether – 10.4% of the entire market in Japan. Sharp used to be the best selling phone manufacturer in Japan for many years, with over 25% market share, before the arrival of the second generation iPhone.